The IAA team recently met up in Darwin for our Strategy Development Day. It was fantastic to be able to get together for the first time since Jesse Moors (CPA Australia) joined the IAA team as Co-Project Director, working alongside Mark Jones, Co-Project Director (CAANZ); Matthew Lancaster, Relationship Manager QLD/NSW/ACT; Richard Hurst, Relationship Manager VIC/TAS/SA/WA/NT; Vanessa Richards, Communications Lead; and Nicole Campbell, Project Administrator. The key purpose of the day was to reflect on 2018 and all of our past activity and to focus on where we would like the IAA initiative to be in the next few years. 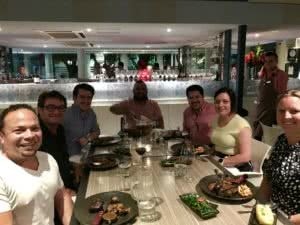 Later that evening, the IAA team met with Renee Feltrin GM SA/NT for Chartered Accountants Australia & New Zealand and Josh Ang GM Northern Territory for CPA Australia. It was fantastic to catch up with them and discuss how we can collaborate and integrate even more with both the sponsoring organisations, CA ANZ & CPA Australia. It was a very productive and rewarding day and it has gone a long way to re-set the IAA up for a bright, successful and deadly future. Stay tuned for updates as we further develop the new strategy and start to implement an exciting program.